Smart technology has found a place in virtually every room in the home, even the one where we take care of our most low-tech needs. In fact, thanks to innovations like sensor-operated, self-cleaning toilets, moisture-sensing ventilation fans, and digital shower controls, it’s possible to turn an ordinary bathroom into the brainiest room in the house. From showerheads with light and sound to digital temperature and water pressure controls that you can set from your smartphone, an array of high-tech features is available to elevate the simple act of getting clean to the level of a luxurious, high-tech experience. You can find something for every preference. Love to shower at night? Install a showerhead that features its own lighting. Dislike fiddling with the controls every morning to get just the right temperature? Opt for digital temperature controls that allow for multiple pre-settings for individual users. Focused on conservation? Try a showerhead that senses what you’re doing — washing your hair, shaving your legs — and automatically adjusts the water flow accordingly. 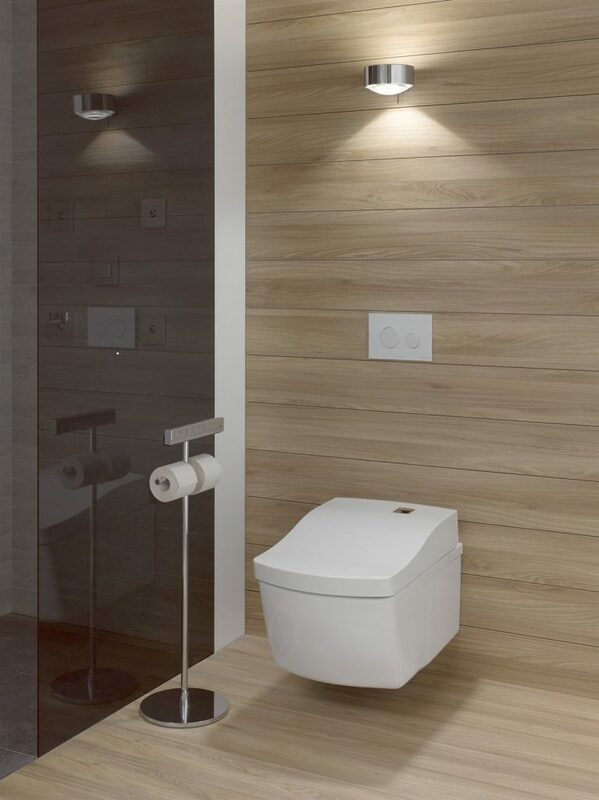 A toilet that cleans itself is a dream come true for many people, but TOTO boosts the intelligence of its NEOREST AC wall-mount toilet even higher. The intelligent toilet features a WASHLET personal cleansing system that uses warm, aerated water for comfort, a warm air dryer, and a heated seat. An automatic opening and closing function and auto-flush ensure you never have to touch the toilet. The toilet keeps itself (and the environment in your bathroom) clean with a flushing system that uses an environmentally friendly combination of gravity and high-speed water jets to spin away waste, while an in-bowl catalytic deodorizer helps keep the air fresh. The bowl itself is glazed with titanium dioxide and zirconium, which when activated by the toilet’s integrated UV light, creates molecular reactions that help keep the bowl free from visible and invisible waste. Not only will you not need harsh detergents to clean the toilet, it’s is also WaterSense labeled, and uses just 1.28 gallons per flush (gpf) for solid waste and 0.9 gpf for liquid. Visit www.totousa.com to learn more. Bathroom ventilation fans serve practical and cosmetic purposes. Ventilation removes moisture and humidity that could promote the growth of mold and mildew and can help exhaust unpleasant odors. Of course, not everyone puts ventilation to its optimum use, and that’s where a new style of bathroom fan comes in. Ventilation fans that sense humidity — such as after someone has taken a long, hot shower — turn on automatically to help remove excess moisture from the room. Some fans can communicate wirelessly with wall switches or with an app that allows you to control the fan from your smartphone. Mirrors and medicine cabinets aren’t just for reflection anymore. Now you can kit out your smart bathroom with mirrors that feature built-in TVs and can communicate with your home’s security cameras, and medicine cabinets with defogging features that can let you get to your post-shower shave faster. Refrigerated medicine cabinets are perfect for preserving delicate drugs and cosmetics, and you can find both mirrors and medicine cabinets with built-in USB ports for charging your devices. * A small robot that mops floor tiles automatically. * A Bluetooth-enabled toothbrush that communicates with your smartphone to monitor how well you’ve brushed. * A smart scale that helps you track your weight and health progress. * A towel rack that uses hot air and ultraviolet light to dry towels and keep them fresh longer. By upgrading to tech-savvy versions of everyday bathroom elements like toilets, faucets, and showers, it’s possible to make your bathroom not only one of the most-used rooms in the house but the smartest as well.